Song is long series of warbled phrases, not unlike that of Mockingbird, but less repetitious. Description: Sexes similar. Grayish above; white below with dark, bold streaking; yellow eyes; white wing bars; and white-tipped outer tail feathers. 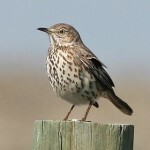 Juvenile is similar, but with streaked head and back. Habitat: Closely associated with sage-dominated grasslands and similar shrubby, arid habitats during the breeding season. 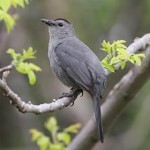 Found in a wider variety of habitats during migration, including open prairies and ponderosa pine woodlands. 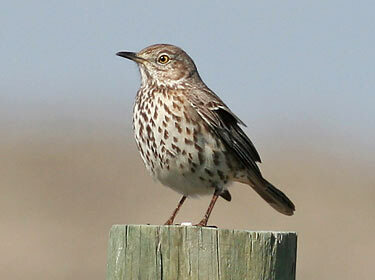 Where in Nebraska: Usually found in the western U.S., it is a casual vagrant in the east. Uncommon spring and fall migrant in the Wildcat Hills. More common during the fall. Probably a rare summer resident in Kimball County. Vagrants seen in other counties. 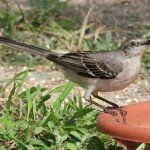 Fun Facts: When disturbed, a Sage Thrasher is more likely to run on the ground instead of fly away.